A Shelf filled with several items. The Shelf allows you to display any item. When right-clicking the shelf with an item at one of the 4 quadrants, the item will be stored in that location. Right-clicking a quadrant which contains an item will pop it out of the shelf. Each quadrant can hold up to 64 of a single item, meaning the shelf can technically store up to 256 items. 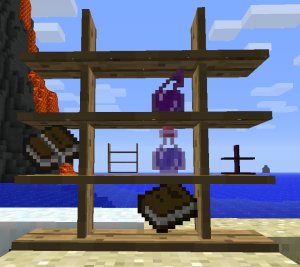 The shelf can be crafted out of any of the four types of wood found in vanilla Minecraft and will appear to be the corresponding color, but note that it must be built entirely out of one type of wood (you cannot mix woods in its construction). As of version 1.1.2 of BiblioCraft, shelves will only display the top center vertical piece of wood if a block is above the shelf; otherwise the top of the shelf will be flat. This is solely an aesthetic effect. Shelf (BiblioCraft) has no known uses in crafting. This page was last modified on 16 October 2016, at 14:58.